Bamar standard cylinders are manufactured with high quality materials. Rods are made from polished stainless steel type AISI 316. Tube, fork and cap are all machined from hardcote anodized aluminium. Upon demand we may supply special lengths and custom cylinders for any application. 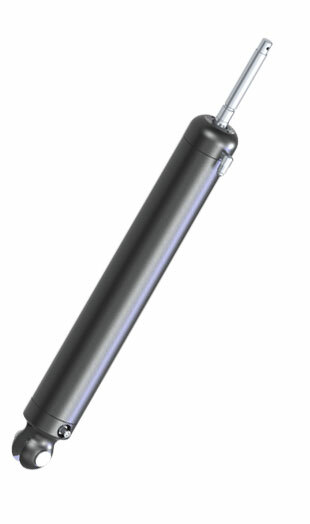 Cylinders are single acting and are equipped with a pressure rod release. This pressure is charged through the “pneumatic” valve located on the cylinder body, opposite to the rod. Gas pressure should be regulated depending on the release speed you wish. Pressure is charged at 100 psi (7.0 bar) approximately. Max pressure 350 bar (5000 PSI). Upon demand, all cylinders may be manufactured with double acting function (push-pull).